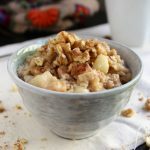 Easy slow cooker oatmeal with healthy apples and cinnamon. Prepare at night and enjoy in the morning. Be sure to use STEEL CUT OATS. These are heartier and take longer to cook so they are better for slow cooking. Experiment with different flavors and fruits.